Keep your large, potted plant elevated and easy to move using the Gardman Heavy-Duty Plant Caddy. Placing your shrub or flower on a caddy helps air circulate around the unit, for a healthy root system, and also allows excess water to drain away from the plant instead of pooling beneath it. This durable, metal caddy easily holds pots up to 9.5" in diameter at the base, and the black color enhances the foliage. The round rods converge into a diamond shape in the center of the piece, creating a stable platform for your favorite plant. Four casters on the base of the caddy elevate your plant with ease, and make repositioning or moving the flower simple. One caster locks in place, stopping the unit from moving accidentally. 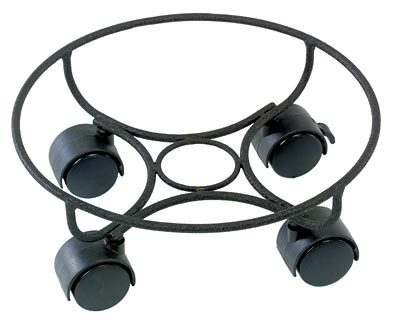 The matte black color on this item is perfect for use indoors or out, as is the all metal body. Ensure your plant is properly positioned with help from this Heavy-Duty Plant Caddy. Capacity: up to 80 lbs. Gardman Heavy-Duty Plant Caddy, Black, 13" dia. Gardman Plant Caddy, Green, 10" dia.